Lots of freezer meals, I love them! 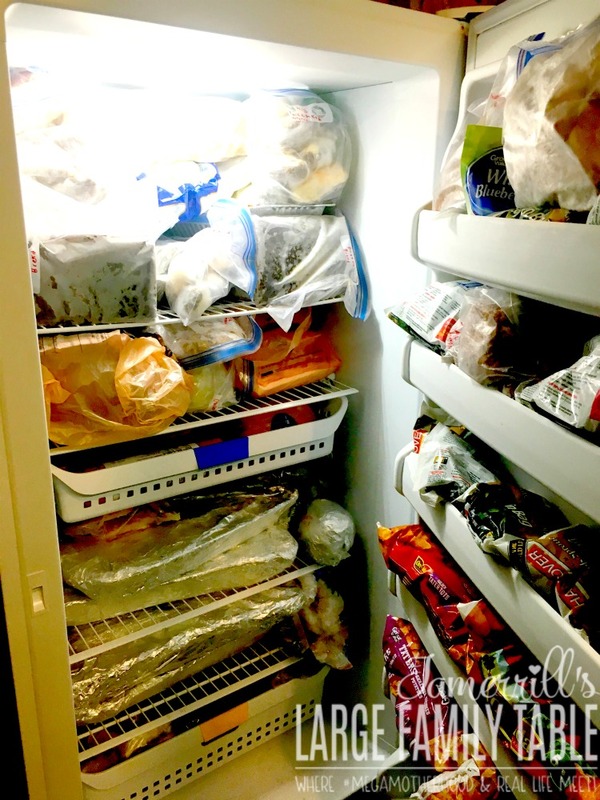 And a few days ago I shared my BIG freezer meals prep day where I prepped tons of food for my large family peeps. 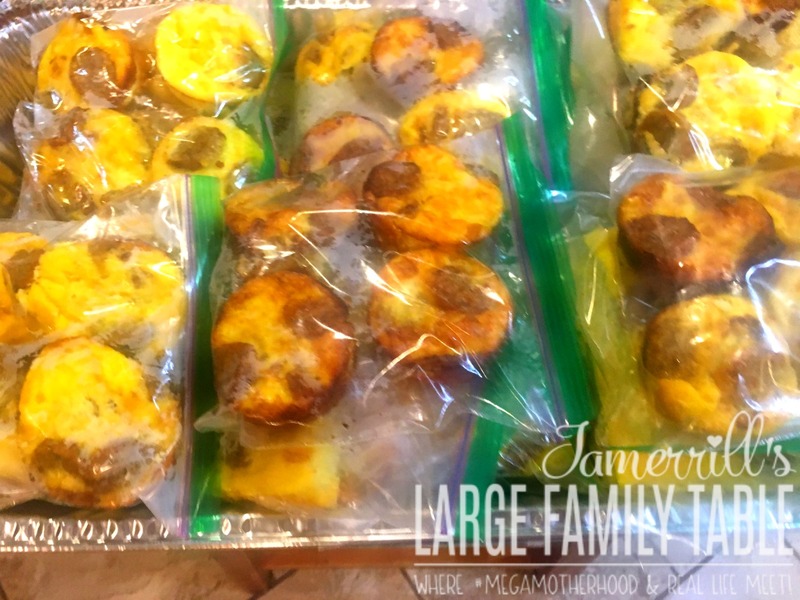 Today I’m sharing with you what I actually did with all of that food I mega prepped for my large family freezer meals! 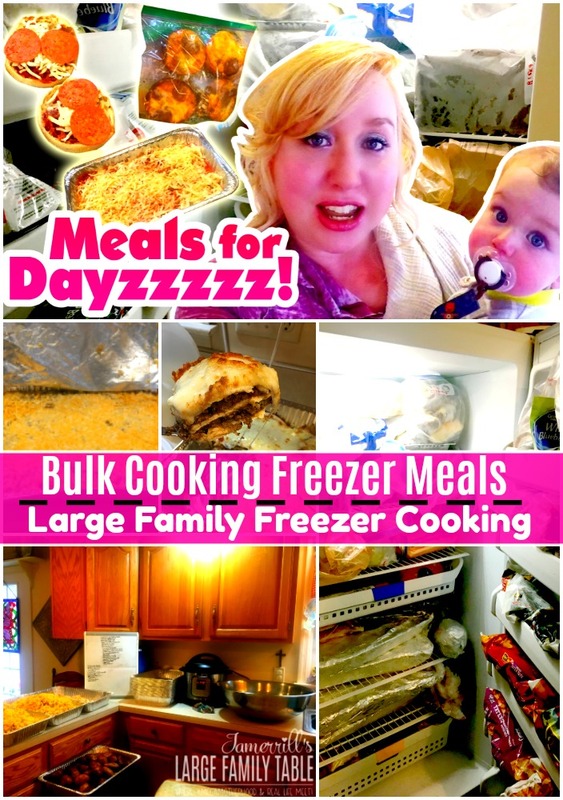 Here’s the full video o FREEZER MEALS FOR DAYZZZZZ! Bulk Cooking for a Large Family if you were looking for that link as well. Large family moms who are walking out feeding lots of children of all ages and stages multiple times a day totally get that it takes lots of food all the time to feed a growing family of many. Also, add in the dynamics that our children are home full-time since we homeschool (so no school breakfasts and lunches), plus both my husband and I are home full-time working from home. As I’ve shared in my large family meal plans this means 90+ meals and 60+ snacks (again, for math insanity, multiply all of that by ten ?). That folks is a lot of food. If you’d like to nerd out further in how much it takes to feed a large family you can enjoy my large family grocery shopping hauls here. Do We Only Eat Freezer Meals and Is This Healthy? After being a momma for almost 18 years now I only know how to make a lot of anything. If you talk with moms of several kiddos you’ll quickly hear how they just make a lot of food all of the time. As a large family mom, you change and adapt as you develop a system that works for you over time. Back when we had three small children ages 6, 3, and infant, and I was a new homeschooling mom who also still worked full-time weekends outside of the home, I started making large bulk cooking meals for my young family of five. This helped my husband on the weekends while he was home with the little ones and I worked 12+ hour shifts. Fast forward to more recent years and our eight children are an infant (almost 1 :), 3 1/2, 5, 7 1/2, 9, 11 1/2, 15, and 17 (the last one is graduated, running his own business, and nearly 18), plus I’m a full-time work from home mom and run our home and homeschool with the help of my husband, there are increasingly more dynamics in the works. 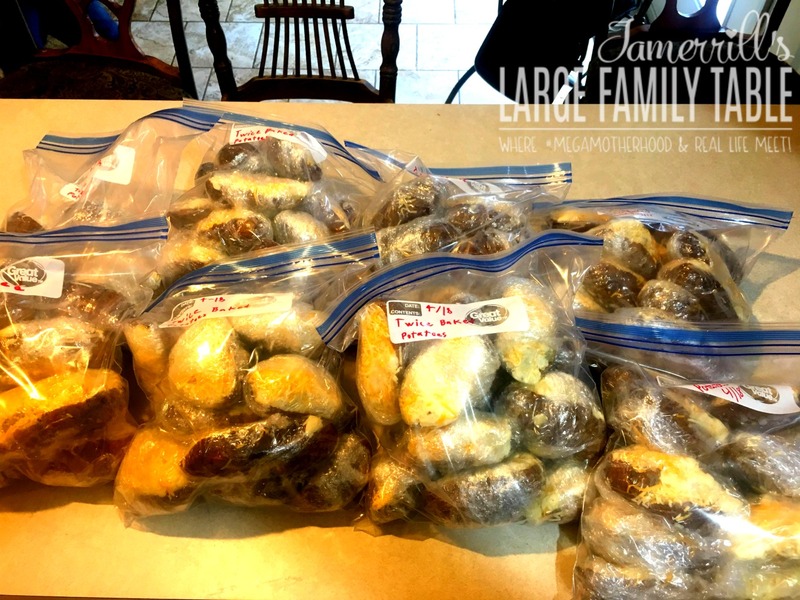 I have found having my freezer jam-packed with large family freezer meals is incredibly helpful for real life! Because I do only know how to cook large amounts (call it a gift or brain trauma!) when I do large family freezer cooking I make mega amounts. However, these meals will not all be eaten one after the other for weeks on end (although I’m NOT ashamed to say we did that with my postpartum freezer meals and it was a huge blessing!). As an example of these new large family freezer meal recipes I’m sharing today we used these as needed over 6 to 8 weeks. We tend to average using freezer meals 3 or so times a week and “fresh cooking” the other 4 or so nights. As far as if my freezer meals are healthy, that really gets down to personal preference, dietary needs, and mom sanity. Some meals are lower carb/high fat (which would go well with Keto/LCHF and Trim Healthy Mama followers), and some are just regular ol’ family style food. The children having a twice baked potato from the freezer as a fun side dish along with a heap of broccoli and baked chicken is fine by me. Also after a day out at the lake (we like to have two lake days a week all summer), it’s a blessing to come home to a dinner that I can throw in the oven. Other nights I serve up large family instant pot recipes or my husband cooks – he’s a steak master! 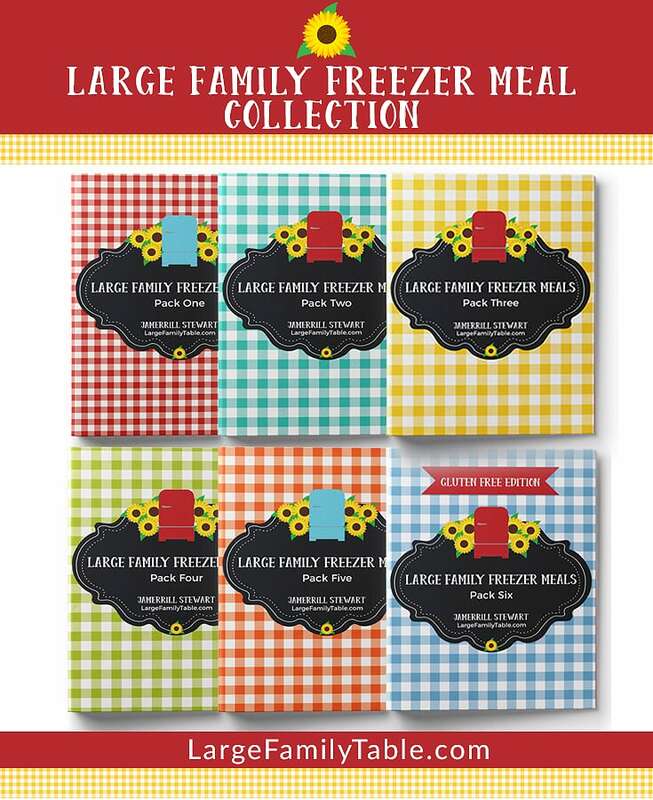 Here’s my list of must-have large family freezer cooking supplies! I share my favorite tools for freezer meals, products, and helps. No Jamerrill, you don’t sweetie. But you get carving out time and getting it done as you can, so good for you, girl! Over the week following, I completed most of my original list of freezer meals including 40 lbs of Twice Baked Potatoes for the Freezer (we’ll be seeing those for months! 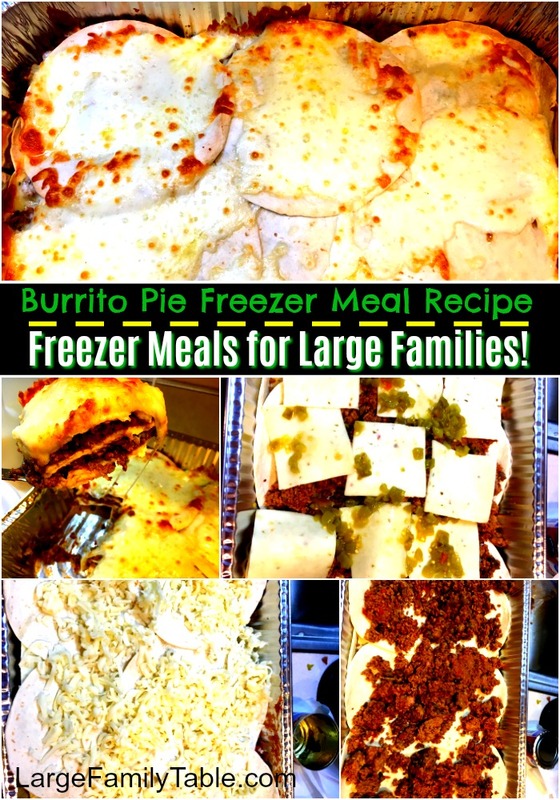 ), three “super mega” pans of this Burrito Pie Freezer Meal Recipe – my husband’s favorite! And this new large family recipe for Baked Beef Macaroni and Cheese Freezer Meal. Also to add to our freezer breakfast stash we made 120 Egg, Sausage, Cheese Protein Cups. One of my sons also made about 8 large pans of Banana Bread for the freezer. Lastly, at some point, I also made about six pizza dough for the freezer balls. I was also *hoping* to make pumpkin bread, breakfast cookies, and another variation of tater tot casserole. By the end of the following week, and with big plans in the works for our oldest son’s homeschool graduation ( more picture flood pictures here and here if you want to see what I do with all of my free time, ha!) I set those plans aside for another large family freezer cooking time. 5 9×11 pans of Double Layer Chicken Parmesan Bake – low carb and Keto/Trim Healthy Momma friendly! To see all of these large family freezer meals in action be sure to watch my new YouTube video, FREEZER MEALS FOR DAYZZZZZ! Bulk Cooking for a Large Family! You are so inspiring!!! – I try and do freezer cooking, and my freezer is always too full of other stuff to fit it in. How do you keep your freezer empty enough for the next freezer cooking day? Any empty space in mine seems like a magnet to stuff – lol!